Wolfsburg (Germany) – The latest evolution of a true motoring icon – the Golf GTI – has arrived: the Golf GTI TCR1. This 213 kW / 290 PS sports car can reach speeds of up to 260 km/h, and is fitted with a 7-speed dual clutch gearbox (DSG), petrol particulate filter and highly exclusive equipment as standard4. 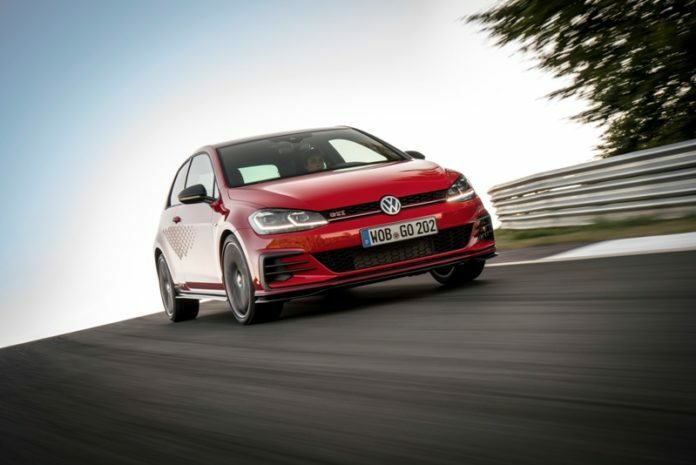 The Golf GTI TCR is even more exclusive than the Golf GTI Performance2/3 (which produces 180 kW / 245 PS) and features technology such as Front Assist, Active Info Display and LED headlights. The standard equipment includes a front-axle differential lock, perforated brake discs, driving profile selection, premium front sport seats with a new microfibre/fabric design, seat belts with red edging plus an exclusive sports steering wheel. As with the racing series, its leather is specially imprinted (perforated leather) at the 3 o’clock and 9 o’clock positions as well as with a red mark at 12 o’clock. 1) Golf GTI TCR NEDC fuel consumption in l/100 km: urban 8.3 / extra- urban 5.8 – 5.7 / combined 6.7; CO₂ emissions combined, g/km: 153 – 151, efficiency class: D.
Golf GTI TCR WLTP fuel consumption in l/100 km: low 10.3 / medium 7.5 / high 6.7 / extra high 7.8 / combined 7.7; CO₂-Emission combined, g/km: 175; efficiency class: D.
2) Golf GTI Performance (NEDC) fuel consumption in l/100 km: urban 9.0 / extra-urban 5.5 / combined 6.8; CO₂ emissions (combined), g/km: 155; efficiency class: D.
Golf GTI Performance (WLTP) fuel consumption in l/100 km: low 10.1 / medium 7.1 / high 6.3 / extra high 7.5 / combined 7.4; CO₂-Emission combined, g/km: 168; efficiency class: D.
3) Golf GTI Performance DSG (NEDC) fuel consumption in l/100 km: urban 7.5 – 7.3 / extra-urban 5.6 – 5.5 / combined 6.3 – 6.2; CO₂ emissions (combined), g/km: 143 – 140, efficiency class: C.
Golf GTI Performance DSG (WLTP) fuel consumption in l/100 km: low 10.6 / medium 7.2 / high 6.2 / extra high 7.1 / combined 7.3; CO₂- Emission combined, g/km: 165; efficiency class: C.
4) German specification. UK specification may differ.